High male cancer rates are down to our unhealthy lifestyles according to a leading world cancer expert. Dr Rachel Thompson, Deputy Head of Science for World Cancer Research Fund (WCRF), right, said it is 'not inevitable' that men in England are 14% more likely to develop cancer than women. Responding to surveys suggesting that men are less aware than women of the effect lifestyle factors such as diet and alcohol have on cancer, the WCRF have produced a Men’s Health Guide. Dr Thompson said: 'Men have higher rates of many diseases than women so it might sometimes seem like this is just a fact of life. 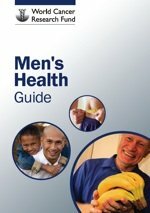 The Men’s Health Guide includes information about risk factors, the most common types of cancer in men and practical advice on making healthy changes, including activity ideas and recipes. To launch the guide, WCRF is giving away free hard copies to the first 200 people who call 020 7343 4205. The guide can also be downloaded.